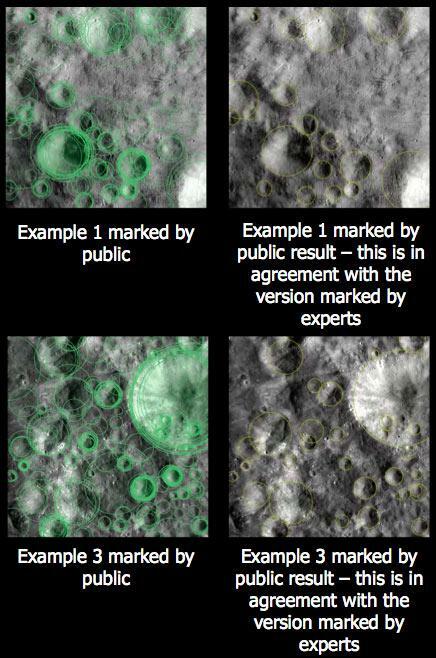 Citizen Science: Non-pro “Asteroid mappers” do as well as the pros. Citizen Science is coming into its own. The idea behind it is that a lot of solid scientific analysis doesn’t need years of training, classes, and pain. In many cases the ground work can be done by nearly anyone with only a few minutes training, and the results are just as good as if a pro tackled it. Case in point: Vesta. That’s an asteroid orbiting the Sun between Mars and Jupiter, and recently enjoyed the company of Dawn, a spacecraft that mapped the surface over and over. Thousands of craters were imaged, and cataloguing them is difficult. It’s hard to train computers to pick out craters that are faint, overlapping, or non-circular. Enter citizen science in the form of Asteroid Mappers. Created for Cosmoquest (full disclosure: I’m an advisor for CQ), it allows you to look at actual images from Dawn and find craters in them (there’s one for the Moon as well using LRO data). It’s easy, fun, and actually rather addictive. Analysis of craters maps made by citizen scientists are as accurate as those of the pros. And accurate! Astronomer Pamela Gay, aka Star Stryder, is project Director of CQ and just announced that they tested the results of Asteroid Mappers using a few regions on Vesta, comparing how “amateurs” did with professional crater spotters. The results were essentially the same. This works best when lots of people analyze the data, which minimizes outliers, that is, inaccurate individual measurements. They found the same thing with Moon Mappers, too. In other words: the more, the merrier! So I urge you to sign up for these projects and try your hand at them. It’s not a game; you’ll be helping real science. And you’ll have fun doing it.